For most English speakers, the word municipality is an awkward, administrative word that usually rings hollow, and it is hard to imagine that it is a much more exciting word to native speakers of other languages. It is defined as ‘a single urban administrative division having corporate status and jurisdictions as granted by national and state laws to which it is subordinate’ – instantly evocative of Kafkaesque bureaucracy. these ancient concepts of freedom, self-organisation and citizen-ownership that are the cornerstones of the New Municipalist Movement. Over the past three years we have witnessed citizen platforms gaining political power and recovering their communities and common subjectivity across Europe and elsewhere in the world. Often in places where the economic and political crises of our time hit the hardest, cities and citizens are standing up to defend human rights, democracy and the commons. Barcelona, Madrid, Paris, Messina and Naples, Grenoble, Frome and other ‘Indy Towns’, Rosario, the list goes on. We have seen Kurdish cities emerging as beacons of participatory democracy in Turkey and Syria, young pro-democracy Hong Kong activists being elected to legislative power while criticising Chinese state oppression, and the Municipal Counter-Voice awakening in the United States in response to Trumpism in the form of Sanctuary Cities. What is the New Municipalist Movement? While at the basis of these points, Bookchin saw New Municipalism as “a recovery of a new participatory politics structured around free, self-empowered and active citizens”. The Municipalist Movement is an expression of the confluence of new politics with the most pressing issues of our time. The New Municipalist Movement is nothing if not intersectional. It combines a cornucopia of ingredients, both in terms of tools and issues. Municipalities act as seedbeds and incubators of political innovation as they develop and test their new ways of doing politics. Sociocratic structures, social cooperativism, urban commons occupation and construction, codes of ethics and electoral programmes developed by citizens, feminisation of politics, citizen-led neighborhood assemblies and crowdfunded political campaigns are some examples. These ingredients have the power to rebuild citizens’ trust in democratic institutions from the bottom-up as they start to tackle the issues affecting their lives: growing xenophobia, a lack of affordable housing, public spaces & basic services for citizens, and the powerful, local, ripple effects of unchecked global capitalism. Municipalities are taking responsibility for creating tangible benefits for their citizens and are not afraid to challenge national and supra-national political processes. A network of Solidarity Cities across Europe tries to address the challenges of migration while defying the apathy of their national governments and the EU. And as the POTUS contemplates leaving the Paris agreement — a sad truth by now — New York’s mayor Bill de Blasio announces on Twitter “we’ll take matters into our own hands” and promises to sign an executive order maintaining the city’s commitment to climate goals. 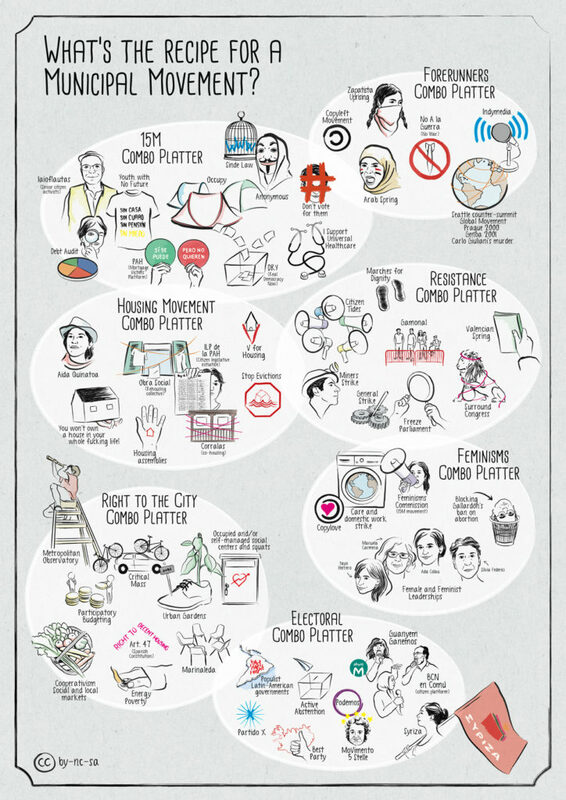 Barcelona en Comú is a great example of a citizen platform that launched in June 2014 that is currently governing in minority in the City of Barcelona as a citizen-led progressive, political party. As a proponent of New Municipalism, their policy agenda includes defending social justice and community rights, decommodification/remunicipalisation of urban services, promoting participatory democracy, introducing mechanisms to tackle corruption, and developing a new and sustainable model of tourism for Barcelona. As Kate Shea Baird, Enric Bárcena, Xavi Ferrer, and Laura Roth from Barcelona en Comú argue here, the Municipal Movement must be internationalist if it wants to be able to battle the global forces that create many of the challenges it tries to address. Supporting the internationalisation of this important movement should be a priority for funders both, from Europe and the US, who want to support progressive values and politics. The EDGE Funders Alliance, the international network of progressive foundations, decided to hold this year’s annual conference in Barcelona, one of the municipalist movement’s hotspots. Driven by the realisation that Barcelona en Comu has a lot to share with the world, the Guerrilla Foundation and group of other funders (Charles Léopold Mayer Foundation, OSIFE, Ford Foundation, Chorus Foundation, Grassroots International, Karibu Foundation and European Cultural Foundation) now support Fearless Cities, a conference organised by Barcelona en Comú from June 9-11, 2017. The Fearless Cities conference will bring together municipal leaders and activists from around the world for mutual support, exchange of experiences and collaboration at an international scale. It is our hope that by supporting the conference, we can contribute to the continued development of the vision of a global revolution that is deeply rooted in local action and connected to social movements. How to get involved as a funder? While all of this is exciting, many funders will be hesitant and even unable to directly support local citizen platforms that will be considered an overtly political activity, not fit for foundation support. In this unique historical moment where grassroots movements form platforms and new political parties, we, as progressive funders, need to be creative and challenge ourselves to find ways to support them. Bold, early stage support for movements which are on their way to establishing aforementioned citizen platforms is one way. Supporting the production of videos and staffing of crowdfunding or -lending campaigns that finance political activity might be another. Think about financing knowledge generation and dissemination, perhaps in the form of case studies and lessons learned that foster exchange and connection among new municipalism protagonists by supporting meetings like the Fearless Cities conference. Watch this space! We will be back soon with an update and report from Fearless Cities. Until then, because this article has clearly piqued your interest, you can read more on P2P politics in Spain here. *“Municipal Recipes: A Conversation about Caring for Cities” (www.municipalrecipes.cc) is a documentary coordinated by ZEMOS98 which was produced as part of the Doc Next Network’s Radical Democracy: Reclaiming the Commons project.